Shaolin Kung Fu Training (Shaolin Monks Training) requires prolonged to understand So I hope that you simply will all persevere Study tougher, practice tougher Yo. 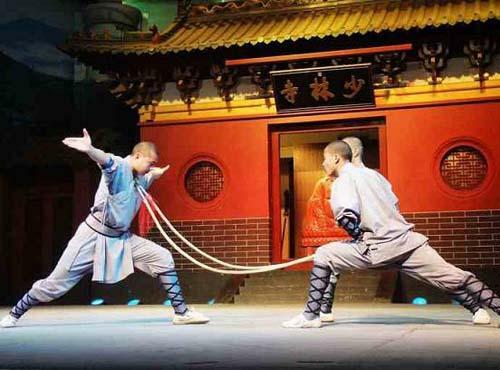 Shaolin Kung Fu Training (Shaolin Monks Training) in China,understand classic external & internal Shaolin kung fu(under Shaolin masters of authentic lineage ) , also includes various fist forms and weapons forms along with their applications, contact sparring and Chi kung. Along with traditional Shaolin kung fu the academy offers to teach the internal styles, such as Taiji (Tai Chi),Wing chun,Wudang, Xingyi, Bagua,Baji and Mantis boxing,(all the kungfu styles mentioned above have their corresponding classes here, meanwhile,the students can choose more than one style of kung fu to understand,two or three styles.) Both male and female students who are 16 or older are welcomed to come and study. Younger students may be accepted if they are accompanied by a parent or an older relative (brother/sister). No previous martial arts experience is required. Only dedication to find out and a positive attitude. However, students with experience in martial arts may be able to understand quicker. In order to ensure the teaching quality, generally, there are around 7 students per master in winter and there are no far more than 15 students per master in summer. This ensures high quality kung fu teaching on a personal level, and a close family atmosphere inside the group. Most beginners cannot resist the temptation of study Shaolin Kung Fu fast; they wish to complete one set of Shaolin Kung Fu quickly. In doing this they will miss the best benefits and purposes of learning Shaolin Kung Fu. It is tremendously mportant to be patient and progress gradually in Kungfu. Hasty learning may not only turn out to be slower in the end. but may even be harmful to the internal body system. The body certainly needs time to acquire and gradually condition itself to new skills. power and speed. The following is a helpful suggestion for beginners who practise daily. (Those who practise on alternate days can adjust accordingly. )Learn one pattern each alternate day. Next concentrate on force, without neglecting accuracy of form. First practise Shaolin Kung Fu throughin a fairly relaxed manner. After Finishing the Shaolin set, practise the first pattern with force. Practice man times. begin with the complete Shaolin Kung Fu. Then practise and repeat with force. On the third day, after performing the whole Shaolin Kung Fu. practise and repeat. In this way you may learn to research Shaolin Kung Fu with force in about a month’s time. You may then beperforming the Shaolin Kung Fu twice, first in a fairly relaxed manner, and then with concentration of force.Later, and gradually, find out to perform the Shaolin Kung Fu both times with force. When you can do this smoothly, proceed to the next stage-speed. The same principleis followed in the procedure. First, practise the Shaolin Kung Fu once with force. Following this, practise and research Shaolin Kung Fu again with gradually increased speed, starting from the first pattern, day by day, till the last pattern, fcventually you can practise both Shaolin Kung Fu with speed. The following is a rough guide for Shaolin Kung Fu Training (Shaolin Monks Training). Each student will find out kung fu at a different rate depending on his/her initial skill level and dedication.The training plan of other Chinese martial arts ,such as wing chun ,Tai chi,Mantis,Bagua,xingyi,etc, is similar to shaolin’s coaching plan Shaolin 2011. (1 week -3 months)Learn shaolin kung fu history and theory, basic punching and kicking with flexibilty coaching and an introduction to Chi kung and Tai Ji. 1-6 Shaolin fist forms, application, Chinese kick boxing with two person sparring and 1 or 2 basic weapons such as the staff, whip, sword or broadsword as well as basic Chinese conversation, Mandarin, Taoism, Buddhism, Calligraphy, acupuncture and massage. All students have the option to find out hard Chi kung which involves conditioning areas of your body for fighting such as your hands and students who study for 1-3 months and cultivate Chi kung will be able to break a house brick in two with their bare hands. (4 months – 1year)Understand shaolin kung fu history and theory, punching and kicking with flexibilty teaching and a more indepth research of Chi kung and Tai Ji. 6-15 Shaolin fist forms including paired practice,application and the option of learning an animal form, Qin na, Chinese kick boxing with two person sparring and a lot more advanced shaolin weapons such as spear, double spear, two-section staff, three-section staff, double sticks, double canes (tonfa) as well as Chinese conversation Mandarin, Taoism, Buddhism, Calligraphy, acupuncture and massage. A lot more advanced levels of hard Chi kung can be reached including breaking wooden staffs over your legs and arms with no injury and the breaking of house bricks using your elbow or knee. (over1 – 2years)Discover Shaolin kung fu history and theory, punching and kicking with flexibilty coaching and advanced Chi kung methods and Tai Ji. Over 20 Shaolin fist forms including application, advanced forms such as tiger, leopard, monkey, snake, crane, mantis, eagle and drunken boxing. Qin na, Advanced Shaolin Weapons paired practice and advanced weapon forms such as double broadsword, monkey staff, double hooks, drunken sword, bull whip,Monk Spade ,southern staff, southern sword and double chain whip as well as Chinese language, pressure points massage therapy and Buddhism. Advanced levels of Chi kung can be reached including using your Chi to heal illness and injury and advanced hard Chi kung such as breaking an iron bar over your head or hammering a nail into wood using the palm of your hand. Students who wish to concentrate their research on the internal martial arts and Chi kung can research Taiji, Xingyi and Bagua palm. Of course, to what degree each student will find out depends on the student’s physical and mental abilities, desire, and dedication to practice. Part of the rules in the Shaolin Kung Fu Training (Shaolin Monks Training) academy. 1.Students must respect the masters, translators and each other. You should live together peacefully and friendly, not fight or cause any bad atmosphere in the school. 2.If a student is struggling with his or her coaching, you should help them, but you should not laugh at or joke about students who are having difficulty. 3.Respect individual’s belief. No gossiping on other’s personal religion or faith. 4.No drugs, tobacco, cigarettes, alcohol or gambling in the academy. 5.Before you leave the school, you have to let your master know where you are going and get his permission to leave. The Academy fosters a peaceful and friendly instruction and living environment for all students and masters alike. Cultivating the value of respect is an important aspect of the Academy. I spent ten months to research Shaolin kung fu in China and I really like the Shaolin Kung Fu Training (Shaolin Monks Training) here. Its really hard, and also very varied so that every day we do something different. If you push yourself in the training, you will feel great in the end of the day, and you are going to feel that you really deserve your rest. During my stay here I trained Shaolin, which I think is amazing, because it is very dynamic and flashy. The hard physical instruction of Shaolin can be weighted up by the calm Qigong classes, where you learnt to calculate your limited energy. I have improved a lot and I have really enjoyed teaching here and I like to learn kung fu here. I was training with Master Rong, who I regard as a great friend and an amazing Shaolin kung fu master. He always has a smile on his face and he jokes around a lot, making the coaching really fun, but he also knows when to be serious. He has rushed me like no one has ever done, and inspired me to train more difficult than ever before, he is a very understanding person and he knows how to push each individual student to do their best. He is very good in acrobatics and therefore focuses more on it than the other masters. I feel very grateful and privileged to have been taught by him. The translators are all really nice. Sometimes they don’t always recognize what you say, but they make up for that with their kindness and willingness to help. They all make a great efforts in helping out as much as possible. The daily life here is really enjoyable. Everybody is really nice and I felt at home almost instantly. I have made a lot of amazing friends here, from all over the world, each with unique trails and personality. And the best thing is which you can hang out with all these amazing people all the time. The food here is really good, and varied from day to day. The surroundings here are beautiful and there is plenty to see if you want to explore outside of instruction. It’s a very calm and serene environment, where you can really focus on your kung fu training. I have not been here for a lengthy time, but for month of training that I have been here I must say that it was one of the best experiences that I had in my life. Ever since I was a little kid and started to learn martial arts. I dreamed of teaching shaolin kung fu in China with shao lin monks, but I never saw this for more than a dream. When the opportunity opened up for me to study in China (which was not long time ago), I looked for a school that can provide me with hard and serious but not exaggerated kung fu instruction. I came here with a wish to understand to find out real shaolin kung fu and improve my knowledge and skill in martial arts. And I must say that my wish has fulfilled above and beyond! In only one month I learned well 3 forms of shaolin kung fu, learned (and had time to improve) my basics of shaolin, finished my “Tai Chi 24 style”, got very flexible (compared to how I came here) and in fitness. I have accomplished acrobatics that I never thought I could do, broke a brick, and developed a great basics for Mantis Boxing and Qi Gong. All those things in just 30 days of coaching! And my gratitude goes out to you! Master Su -Thank you for everything that you have done for me, and thank you for opening up the world of Qi Gong and Tai Chi for me. I will keep practicing! Thanks to the cook for all the great food and the hard work in fixing our problems all the time and of course making sure we always look forward for the meals! ^ ^Thanks Master Qu for the teaching of mantis boxing! Thanks for the translator. Thanks for the whole hard work you have done to me. Thanks to all of you! You have been great and kind to me. I learned a lot and mostly–fulfilled my dream! Kung Fu is something more than simply an ability to fight and defend yourself, it's a state of mind. I'd love to live the monk lifestyle, but God knows I can't really give up pizza. Thanks for the article, keep up the awesome blog!